It’s been a little while we have heard anything on how the production of Shenmue 3 is going, but, just the other day, creator Yu Suzuki took to Kickstarter to post some details about it. In his Kickstarter post, Suzuki revealed a diagram that shows the development progress of the upcoming game. He explained that “So far, we have finished the composition, story, planning and the game flow,” and “will be advancing to the next development step soon.” The graph below gives a brief overview on what those steps actually mean. 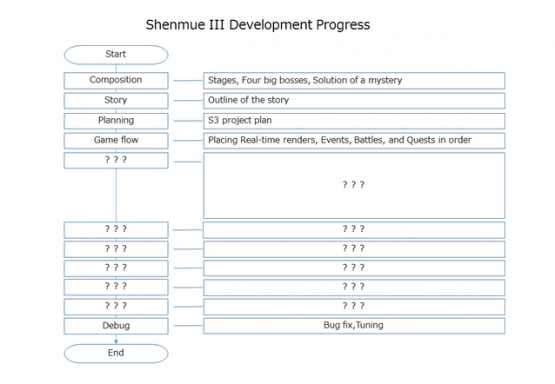 Suzuki also explained that he will be posting more information on the development stage, and will be “updating you about the progress of the development at least once a month.” Are you excited for Shenmue 3 to enter the development stage?